It's hard to imagine confirmed Straussians not wanting this starry Metropolitan Opera performance of Elektra. Strauss and his librettist, Hugo von Hofmannstahl, transformed Sophocles' take on Homer's tale into a harrowing opera noir. Elektra lives for one reason, to kill her mother, Klyt?mnestra, and her stepfather, Aegisth, the murderers of her father, Agamemnon. In contrast to Elektra's vengeful obsession, her sister Chrysothemis desires to get on with life. When their long-missing brother, Orestes, returns to do the deed, Elektra celebrates with a dance of death and, her sole purpose in life fulfilled, dies. Strauss joined the hermetic plot to music of the utmost opulence, violent and yearning by turns, evoking the cardinal principles of Greek tragedy - pity and terror. This Met performance from February 1980 is notable for the playing of the orchestra, itself a major factor in any performance of Elektra, and for the three female leads. James Levine's conducting is full of passion, lyrical when it needs to be, but crushingly powerful in the big moments. Strauss' orchestration sometimes becomes chamber music-delicate, eloquently done by the orchestra. Birgitt Nilsson and Leonie Rysanek were the leading Elektra and Chrysothemis of the day. Nilsson was in her 62nd year, still singing well, even in such a demanding role that taxes singers half her age. But despite small signs that she's husbanding her vocal resources and hints of wavering pitch that indicate tiring, she gives an overwhelmingly intense performance. The booklet notes say that Rysanek was ill with a 102 degree fever, but there's no indication of it in either her singing or her passionate acting as. Mezzo Mignon Dunn, the Klyt?mnestra, was a Met mainstay for 35 years, and if she lacked the superstar status of Nilsson and Rysanek she more than holds her own here, virtually dominating the stage in her scenes and fully capturing the character's pain and frustration. If the men are not quite up to these three formidable ladies, that's par for the Elektra course. Both Nilsson and Rysanek (sick and with high fever) are not in their prime, but WHAT a great piece of THEATRE! Nilsson's involvment in this role is overwhelming too such a degree that you can ignore that her voice sounds a bit worn. The public roars - and rightly so. 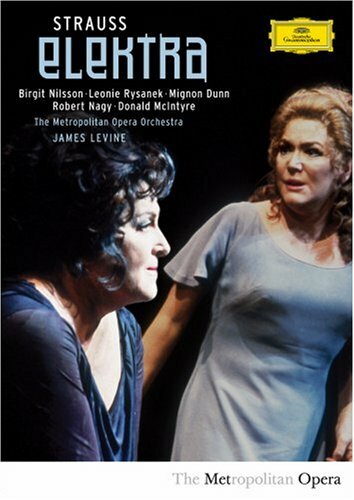 If you want to experience Nilsson as one of the truly great actors of the operatic scene, buy this DVD at once. I was deeply moved and cried at the end. great video...but the PERFORMANCE! ...............WOW! 1. this performance was not Nilsson's return to the MET after a five year absence. Her first Elektra in 1980 was on February 1 and this recording is from February 16. For me, Strauss' tale of ghastly family dysfunction has always been an opera better heard on record than seen in the opera house. Its hysterical atmosphere and bizarre characters, while providing tremendous opportunities for singers to display their power, range and stamina, also seem to encourage overacting and hamhanded emoting. Such is the case here. Mignon Dunn as Clytemnestra is the least offensive and actually delivers some truly beautiful singing. But soprano Rysanek whose histrionic skills--for reasons completely unclear to me--were considered non-pareil delivers another ourtrageous performance with excesses that seem based on the worst excesses of the silent screen era. Donald MacIntyre as Orest sings decently but visually is just ridiculous. Nilsson is past her vocal prime but at least does not embarass herself as do her colleagues. To her credit she underplays much of her role allowing the fevered music to make all of the necessary points. Even so, without the benefit of aesthetic distance, the viewer can see a certain calculatedness to her movements, a quality that belies the out-of-control emotionalism that she is trying to portray. The star of this show is Levine whose conducting is all that that one could wish for. As I suggested earlier, there are certain operas that call for physical acting skills that are just beyond the abilities of the average and even great singer. Watch Renee Fleming's Blanche DuBois in Previn's "Streetcar Named Desire" for a recent example. While vocally they can be quite pleasing and even thrilling, the talent to translate their musical gifts into believable behavioral action is not always theirs to command. Unfortunately, I feel that many of we opera fans have learned to settle for and accept second rate and really rather silly exibitions as examples of great art. No wonder Callas seemed so revolutionary.